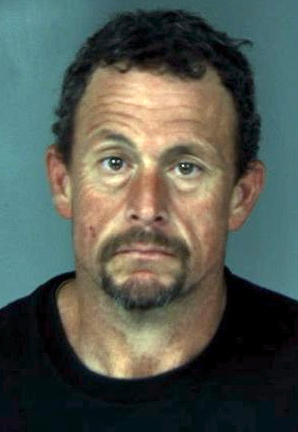 On Wednesday, May 17 at about 3 p.m. the Humboldt County Sheriff’s Office received a call from a citizen who reported witnessing a man smash a driver’s side car window on a 2002 Toyota Camry at Mad River Beach parking lot. The witness said after the man smashed the window of the vehicle he reached inside and unlocked the trunk from which he removed two purses. The witness provided a description of the suspect to the Sheriff’s Office Dispatcher. Deputies were immediately dispatched to the scene. While deputies were en route to the Mad River Parking lot, another witness called the Sheriff’s Office and said he was following the suspect who was now riding a bicycle heading eastbound on Mad River Road. A deputy in the McKinleyville area responded to the Hammond Trail Bridge on the north side in case the suspect fled that direction, while other deputies responded to the scene. The witness told the dispatcher he watched the suspect ride onto the Hammond Trail Bridge and a deputy met the suspect on the north side (Fischer Road, McKinleyville) and detained him. When the deputies arrived at the Mad River Beach Parking area they located and spoke with the victim. The detained suspect was identified by witnesses as the man who broke into the vehicle. Deputies located some of the victim’s stolen property in the suspect’s possession, and recovered the stolen purses stashed in nearby bushes. Deputies arrested Anthony Wayne George, 45, from Fieldbrook. When they arrested George they located burglary tools, several knives and less than an ounce of marijuana in his possession. George was transported to the Humboldt County Correctional facility where he was booked for possession of stolen property, burglary, possession of burglary tools, possession of less than an ounce of marijuana and violation of probation. George was on felony probation for possession of illegal drugs. His bail was set at $50,000. This entry was posted on Thursday, July 18th, 2013 at 1:41 pm	and is filed under News. You can follow any responses to this entry through the RSS 2.0 feed.